Faux Bucktail is synthetic bucktail which is better than real hair; plus, Bambi didn't have to die for this stuff. It is easy to stack and easy to tie with. 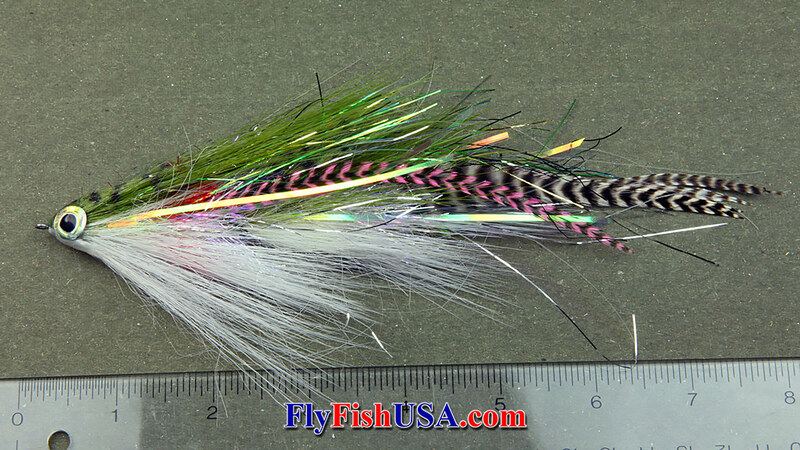 Faux Bucktail is capable of tying everything from tiny dry flies to massive articulated streamers. 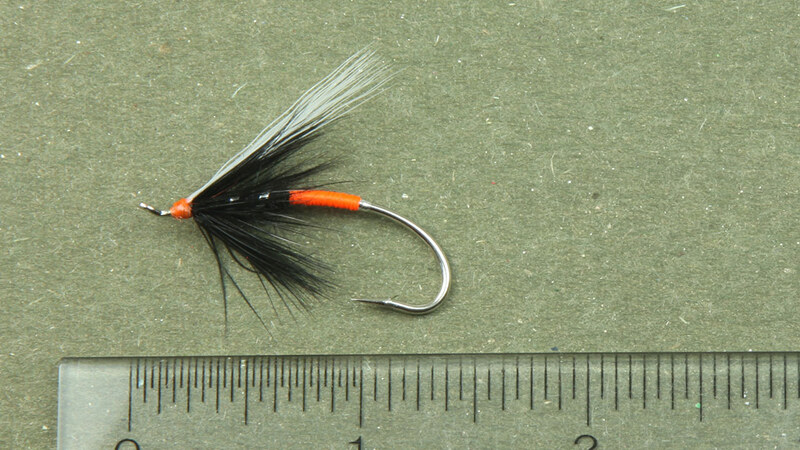 The next six examples of fly patterns below were tied by The Fly Fishing Shop's employee, Frank Day. 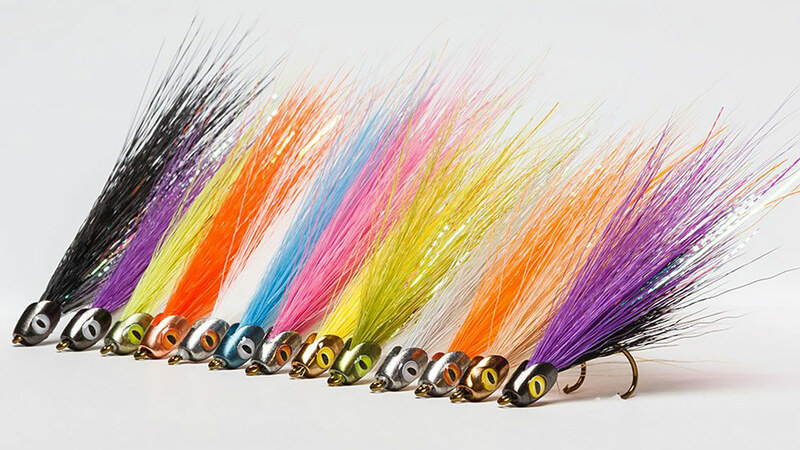 Here a mixture of Faux Bucktail and various kinds of flash are used to tie a 7-inch long (3) section articulated pike fly. This fly is tied on (3) Fish Skull Articulated Shanks, which are made from stainless steel. Add a stainless steel hook and this fly has the capability of being used in both freshwater and saltwater, allowing for maximum versatility. Additionally, if you are targeting fish that have teeth Faux Bucktail is more durable than any natural hair. Faux Bucktail doesn't absorb water like natural hair, so flies tied with it remain lightweight and comparatively easy to cast. It also does not have a hollow core like real bucktail which allows for a large profile fly that will sink easily for deep presentations. Frank tied this (3) section articulated fly to simulate an 8" rainbow trout--the perfect size to fit the mouth of a large Bull Trout, Lake Trout, Brown Trout, or Bass. This and the fly above were tied using Pro Tabbed Eyes. It should be noted that eyes on baitfish flies are an important predator fish target. The head and eyes of this baitfish pattern were constructed with liberal amounts of Pro Sportfisher UV Resin Thin Flex. This 5" inch long Mark's Sardina tied by Frank was an experiment using Faux Bucktail to replace another synthetic fiber; in this case, he replaced Unique Hair with the Faux Bucktail. Each Faux Bucktail fiber is tapered, which allows for lots of flex and action in the water. 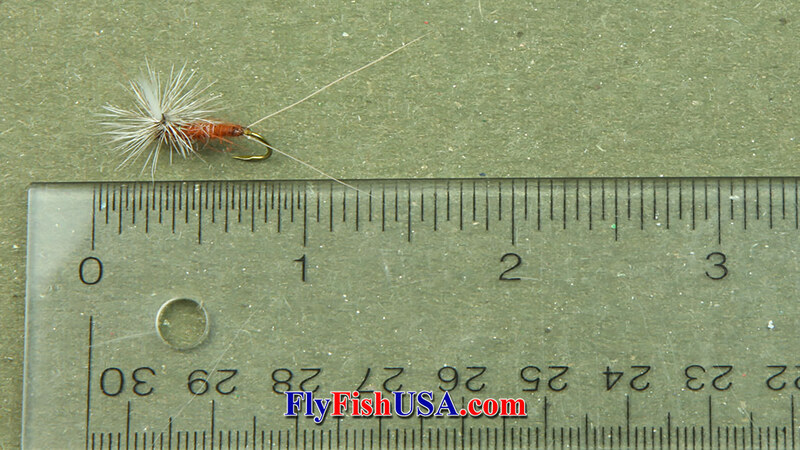 Non-tapered fibers such as Unique Hair are very durable but don't have as much action when used in short flies. Here Frank used Faux Bucktail to replace real bucktail to capitalize on the durability of synthetic fibers. This is an advantage when you use flies repeatedly in saltwater like the Clouser Minnow type flies. 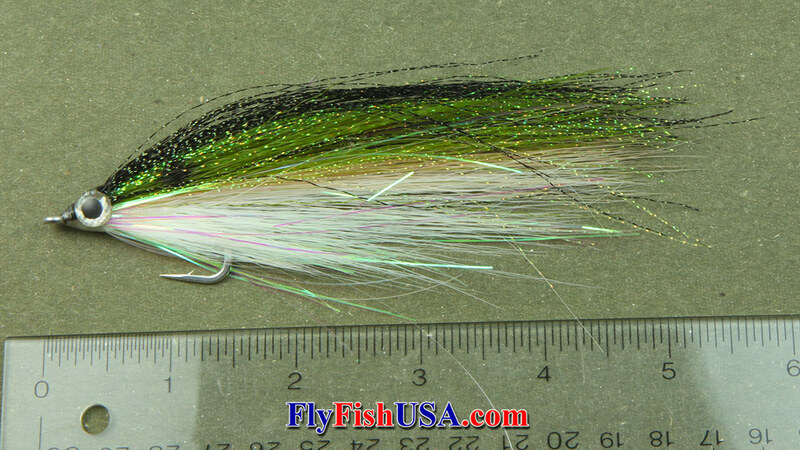 The first place that Clouser Minnow start to come apart is where the white bucktail transitions under the eye. Natural bucktail fibers often break at this point which ruins the profile of the fly, therefore, making it less effective. Faux Bucktail, however, is incredibly durable and adheres to a variety of glues and resins much easier than a natural hair fiber. Once bonded with some sort of cement or resin the fibers become nearly inseparable and indestructible. Faux Bucktail may be the ultimate winging material for traditional summer steelhead flies; it certainly is the easiest to stack. The fibers are slick, straight, and uniform plus of a consistency similar to polar bear hair in this application. Frank tied this fly reverse wing so the butts of the fibers are anchored firmly under the body of the fly, as a result, they can never be pulled out. To use this method, tie the wing in first facing out over the eye of the hook, then tie the rest of the fly. Next, pull the wing back over the top of the fly and tie the head over the wing base. When you use this method, the wing will probably last longer than the rest of the fly. Using a fine strong thread such as Veevus 10/0 can greatly aid in tying with this method. 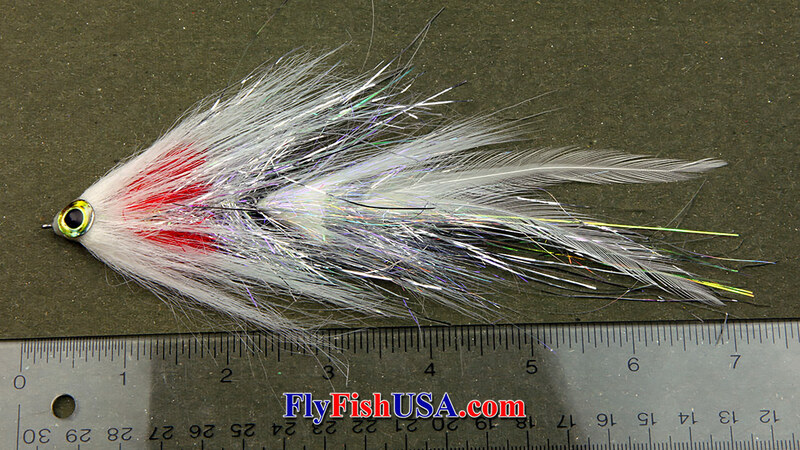 Frank tied this parachute style trout fly using Faux Bucktail for both the wing post and the realistic split tails. 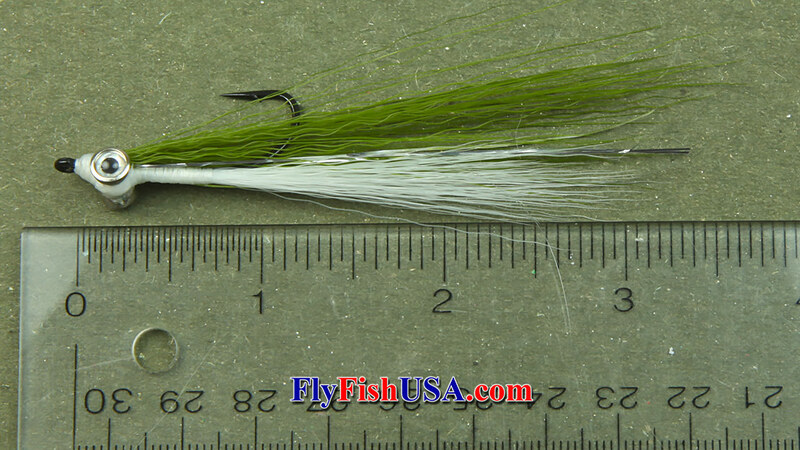 As previously demonstrated, Faux Bucktail is some of the most adaptable fly tying material available. Your imagination and creativity are your own limiting factors concerning the endless uses for Faux Bucktail; every fly tier should own some. 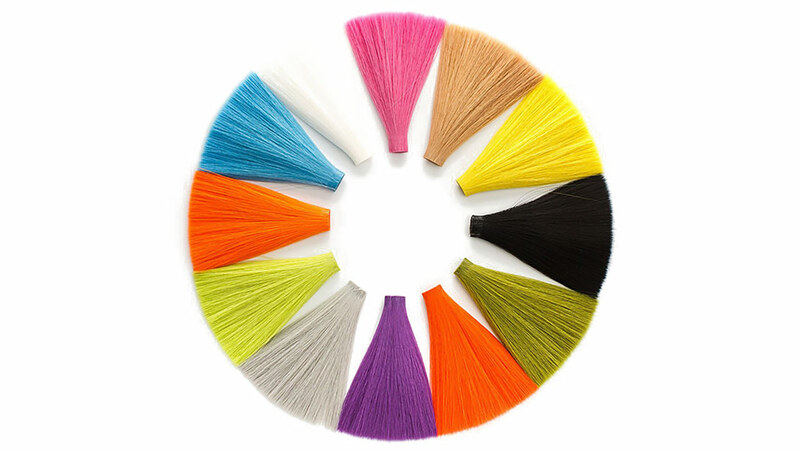 This dramatic photo (above) from Fish Skull Company illustrates the dramatic selection of colorfast colors of Faux Bucktail.